← Pioneer One Finale Thoughts! John Ostrander is comics legend. He’s written for Marvel, DC, and has now taken a new post a long, long time ago in a galaxy far, far away, writing comics for Dark Horse’s line of Star Wars comics. 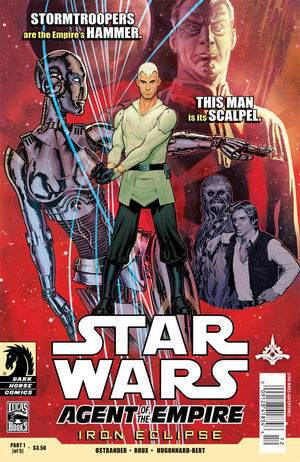 Having recently ended his line of far-future Star Wars: Legacy comics, featuring the adventures of Luke Skywalker’s descendant Cade, Ostrander has moved to a time before the legend of Luke with his new comic – STAR WARS: AGENT OF THE EMPIRE. We got a chance to interview John Ostrander himself about the project. GEEK CRASH COURSE: Geek Crash Course is designed to bring new people up to speed on geeky ideas, so tell us: what do you absolutely need to know about Star Wars in order to pick up Agent of the Empire? Can you give us a Geek Crash Course on Agent of the Empire itself? JOHN OSTRANDER: The story starts about three years BEFORE the start of A NEW HOPE and focuses on the adventures of Jahan Cross, the titular Agent of the Empire. His cover is that he is a Diplomatic Envoy but he reports directly to Armand Isard, the head on Imperial Intel. He works with a “naked” Human Replica Droid (HRD) named IN-GA 44. She’s naked in the sense that she has the metal frame, no synthiskin or hair to disguise her. Cross himself is a firm believer in the order that the Empire provides and fights for that. He’s had personal experience with chaos and that has shaped much of his outlook. GCC: The art in Agent of the Empire is great. How did you and artist Stéphane Roux cross paths? OSTRANDER: Credit our esteemed editor, Randy Stradley, who did that. Stéphane and I then met at last years C2E2 in Chicago and got along terrifically. Talented artist, nice guy. GCC: Cross is one of the few leads in Star Wars who isn’t a Jedi or Sith, what was it like not being able to rely on Force tricks like telekinesis, mind control, or the ability to fire lighting from their fingertips? OSTRANDER: Challenging and liberating at the same time. The challenge is to make it FEEL like Star Wars WITHOUT the usual trappings but that’s also makes it interesting. Cross has great skills and a cunning mind – and a ruthless side a mile wide. I think readers will find that he works just fine in Star Wars. GCC: There’s a great surprise appearance by two favorite characters from the classic trilogy in the first issue of the series. What was it like getting to play in the Star Wars Universe? What were the coolest things you got to write? OSTRANDER: You mean Han and Chewie. What fun! I’ve always loved these characters and this is from BEFORE we first met them in A NEW HOPE so Han still has all his sass intact. He and Cross know each other already and the banter between them was a lot of fun to write. GCC: Star Wars is known as a pretty meticulously planned franchise. Was there anything you weren’t allowed to do? OSTRANDER: Not really. Everything I do on Star Wars is not only checked by my editor but by Lucas Film Licensing, who have been very encouraging. I’ve also worked in Star Wars for more than a decade and I have a pretty good feel for what works and doesn’t work in a Star Wars story. GCC: As excited as I am for Agent of the Empire, I have to ask about some of your classic work. You were the man who brought Barbara Gordon back to popularity as Oracle in the 1980s after her crippling injury at the hands of the Joker. What are your thoughts on DC healing her and returning her to the Batgirl role? OSTRANDER: I’m proud of my work on Barbara (much of which was done with my late wife, Kim Yale) but I don’t own the character any more than I own any of the Star Wars characters that I write. My work exists and we had a pretty free hand in writing our stories about Barbara; I couldn’t very well deny that to anyone else. Besides, that “anyone else” happens to be Gail Simone who is a terrific writer, a good friend, and who loves loves loves Barbara Gordon. I wish her, and the character, nothing but the best. GCC: Finally, a basic geek question: If you could have any superpower, what would it be? OSTRANDER: Time travel – so I could get caught up on my deadlines! And maybe peek at the winning lotto numbers before they happen. GCC: Thanks for talking with us! STAR WARS: AGENT OF THE EMPIRE #1 is out December 14th in a comic shop near you or online at Dark Horse Digital. Special thanks to Mr. Ostrander and Aub Driver from Dark Horse Comics! This entry was posted in Currently Geeking, Interview and tagged agent of the empire, comics, dark horse, dark horse comics, interview, john ostrander, star wars. Bookmark the permalink. I AM AND WRITER MYSELF , AND AM CURRENTLY WORKING ON A NEW STAR WARS SERIES AS WELL , I WOULD THE OPPORTUNITY TO WORK WITH JOHN OSTRANDER TOO. MY CONTACT INFORMATION IS BELOW .